Dr. Jette encourages PT educators to keep an open mind to new perspectives. Photo by Mike Pascoe. 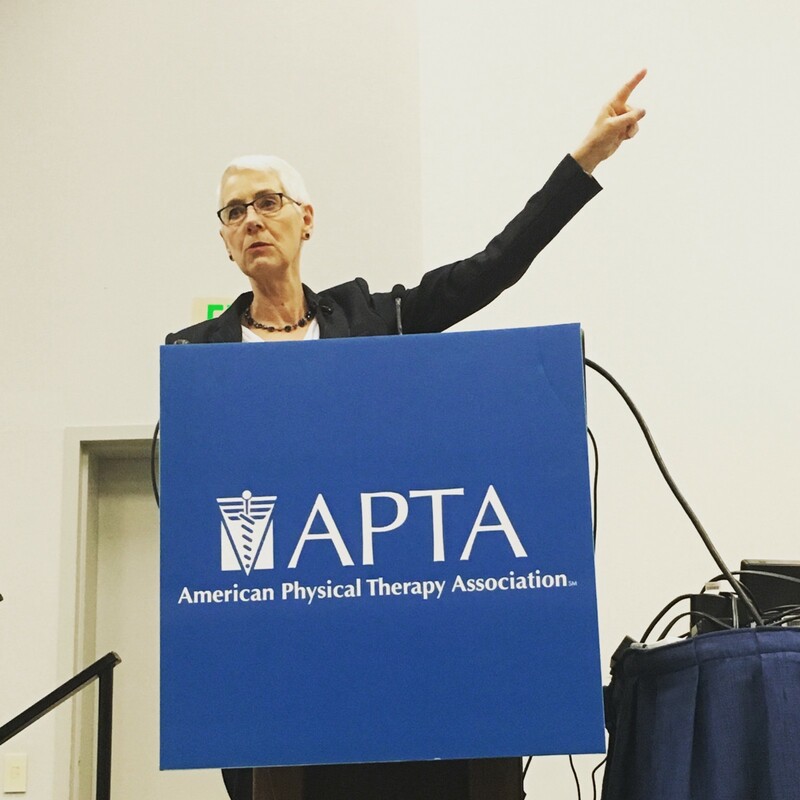 On Day 2 of the CSM educational programming, Dr. Diane Jette PT, DPT, DSc, FAPTA gave the 2016 Pauline Cerasoli Lecture to a packed out room in the Anaheim Convention Center. This session, hosted by the Education Section, is consistently a source of inspiration to myself and everyone that attends. 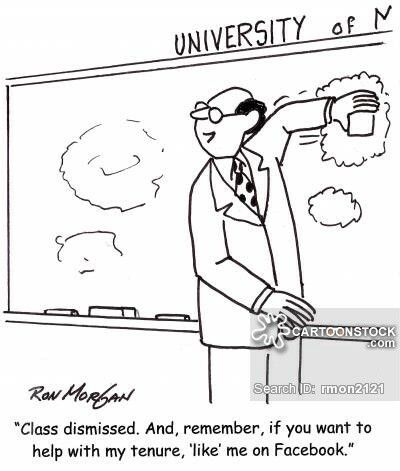 Dr. Jette examined trends [problems, really] in higher education, which she argued are not isolated to undergraduate education, and proposed potential future effects on the DPT education. The audience was challenged to question their assumptions and open up to new ways of thinking about their role in educating future healthcare professionals. 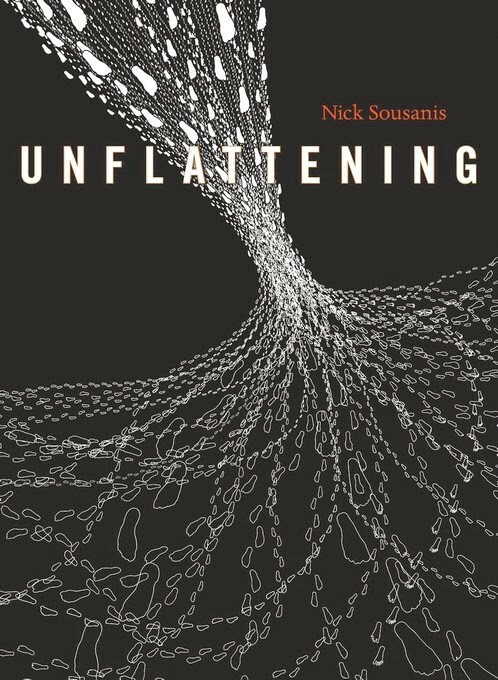 Dr. Jette found inspiration for the framework of her lecture after reading ‘Unflattening’ by Dr. Nick Sousanis. This book is meant to challenge narrow, rigid thinking that Sousanis calls “flatness.” This is a take on the concept of flatlanders, which are a group of people that only exist is two dimensions and cannot fathom the idea of a vertical “upwardness” [summarized by Carl Sagan in Cosmos in video embedded below]. Jette uses this analogy to describe the current state of higher [DPT] education — that we are all in a stasis of thought. So, to break thru this stasis and engender new ways of seeing PT education, we must Unflatten higher education. Lots of things are broken regarding the finances of PT education. Tuition increases have not been met by increased financial aid. It’s great when earnings post graduation justify the large expense of the degree, but is that really the case in PT? What if programs were required to post cost relative to earnings? Would that change the way tuition is structures? Poor business practices are not helping the situation either. A survey of university CFOs revealed that many are not confident about their institution’s financial model for the next ten years. In tandem, several programs across the U.S. are struggling to maintain a positive budget. Some are meeting revenue decreases by attempting to increase enrollment by adding lavish buildings to their campuses (e.g., a rec center with a gorgeous climbing wall). Yet, there are no data indicating that these buildings increase enrollment. 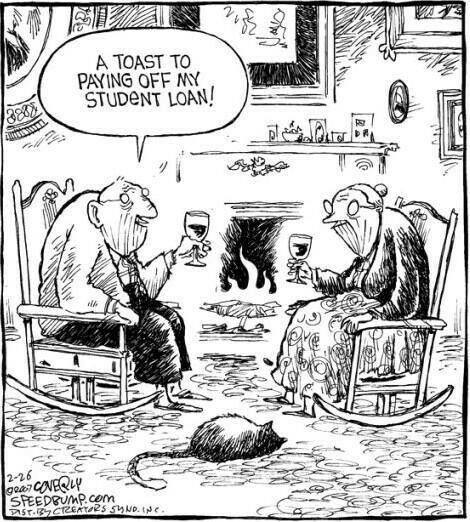 Unfortunately, currently enrolled students are the ones that foot the bill. And why focus on fancy buildings anyway when emerging technologies are making brick and mortar obsolete? There is an increasing percentage of faculty aged 65–75 remaining in faculty jobs. A smaller percentage of faculty are full time, which increases the reliance on part-time faculty. A consequence of this is an increase in time dedicated toward all committee service, advising, and mentoring by the the full-time faculty. Dr. Jette asks if we are in a PT education bubble market — and when will it burst? Moving on to another illustrated panel from Dr. Sousanis’ book, we see drone-like figures on a conveyer belt passing through what the author calls “an elaborate sequence of discrete stores.” This reminded Dr. Jette of the prerequisites PT admissions committees put in place, which she claims have not been tested and shown to be valid predictors of success. Perhaps these sets of course requirements are narrow-minded and yield a cohort of students that all look the same. Why are community college courses viewed as a lower quality than a four-year university? No wonder diversity is limited and unchanging in DPT school and the profession, while race and ethnicity are shifting across the U.S. Minorities have limited opportunities already at the pre-req stage. Jette also stated that reliance on GRE scores creates racial bias because is one of the biggest determining factors of a students’ performance on the exam. Jette then pointed out that courses in the first semester of four DPT curricula she sampled varied widely, yet DPT students all take the same licensure exam. This raised the question — What do DPT students and graduates need to know for adequate practice? Jette exclaimed that they need to learn how to discern value of information! Multiple choice questions do not teach how to prioritize information, no matter how good a writer you are. Jette asked us to consider if our programs prepare DPT students for the real world of practice. Then we saw one of my favorite charts, DPT student GPA upon matriculation as a function of time. It is a steep rise over the years, some cohorts have an average GPA of 3.75. However, graduation rates and professional violations have not been changing in parallel, so why push for these larger numbers? Back to finances, which was a topic hard to escape from this year at #APTACSM. Jette again presented data, this time reminding us that student loan debt is at an all time high over the past three decades. The average student has racked up $92K for undergraduate and DPT degrees. This is directly related to the 100% increase in tuition over that same amount of time. Not helping the situation is the fact that household income has only increased 2%. Will students continue to pay these ever increasing tuition prices? Jette then reminded us that a good income to debt ratio is greater than 1.00. If the average PT job salary for an entry-level graduate is $77K, then the ratio comes to 0.84 = NOT GOOD! Now that we all felt really good about the situation (yikes), Jette brought us back to the beginning of her talk to remind us that all we need to do to influence these trends is to “Unflatten” our thinking to access the vertical plane and test new possibilities. Jette likened our current situation to one of the flatlanders, sitting pretty and comfortably unaware of information that can be used to improve education. This can be achieved by giving credit for community college courses. In fact, some degree programs allow students to take the first year courses online. And that ethnicity biased GRE? Supplement it with tests of emotional intelligence. Lastly, acknowledge that requiring observation hours can disadvantage already disadvantaged students because they don’t have access to those resources. This supposition speaks to the static format of lecture in which the lecturer has their back to the students, reading off of a list of bullet points. Jette encourages instructors to find innovative ways to deliver facts before class and to then reserve in-class time for discussion of difficult situations. Jette encouraged the use of blended learning strategies. I can think of no better way to facilitate networked connections than social media such as Twitter. Jette had several parting thoughts to share as she concluded her lecture. For example, we don’t share enough. There may come a point that didactic content is containing within learning modules that are created by learning experts. Perhaps one way to address the varied styles and paces of learning is to give students the ability to demonstrate competencies at their own pace. The development of combined DPT/PhD programs would lead to a robust professoriate. Overall, DPT educators should keep an open mind to new perspectives and aspire to reach new vantage points. Using the flatlanders as an analogy — perhaps we will access a future fourth dimension. Dr. Jette then announced that for the first time ever, she would be taking questions from the audience, which she referred to as the kiss of death. So she cleverly adjusted the purpose of the time as an open-mic session for those in the audience to share innovations they have implimented in their DPT curricula (e.g., the University of Colorado participating in the year-long internship model of clinical education). Chad Cook, PT, PhD, MBA, FAAOMPT was announced as the recipient of the 20th lectureship. Congrats! Looking forward to covering that lecture from San Antonio. P.S. I have also written summaries of the 2011 and 2012 Cerasoli Lectures if you happened to make it through this review unscathed! Hat tip to an excellent writer on the Medium platform — Eric Robertson. He recently posted his commentary from CSM and it is really good! I am an Asst Prof at the Univ of Colorado. I teach anatomy to PT, PA, MD, and DDS students.